With the help of Mr.Shopper, designed for touch smartphones Nokia, you will receive a personal assistant when shopping, which allows you to easily manage multiple shopping lists. The application has an intuitiveinterface that is rich in functionality. You can add the necessary goods to the local database, which later will allowyou to select from a list of products to save time when sostavleniinovyh shopping lists. In addition, the program pozvolyaetsortirovat goods in different categories, add to the selected product personal notesuser to specify the quantity of goods on the list, and specify itsvalue (supported by the possibility of multiple units of measure). The program is presented by the developer in two versions: Full and Lite. 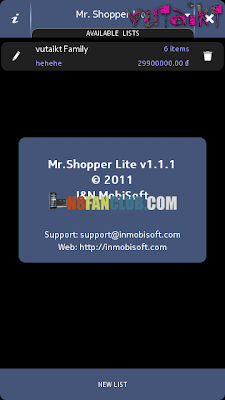 Limitation of Lite-version is that the program allows you to create Mr.Shopperlishodin shopping list at one time. For correct operation of the installed components are required programmyMr.Shopper Qt version 4.7.3. Also need to install additional libraries QtMobility.